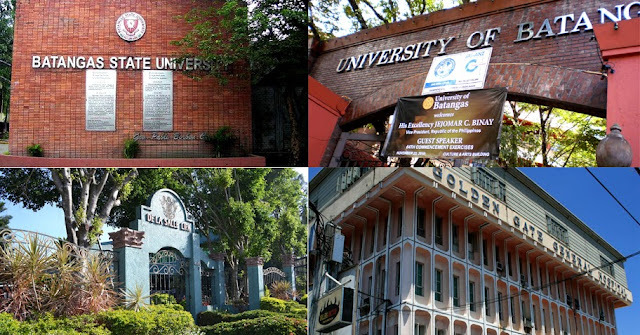 Collage of facades of some of Batangas' universities. University level education in the Province of Batangas has gotten to the point whereby students who have graduated from K-12 no longer need to go to Metro Manila – as used to be the case – to be assured that they will get quality instruction. In fact, in the present day, many of Batangas’ different colleges and universities frequently outdo many of their counterparts in the capital in the various professional licensure examinations. Moreover, some of the schools in the province boast of sprawling campuses with structures and facilities that are comparable to if not outright better than those that schools in the capital have to offer. Below is a listing of university level schools in Batangas, many of which offer not just bachelor but graduate programs as well. Do you have a school that you wish to be listed? Click here to submit the school's name and other information from which the school can be verified.